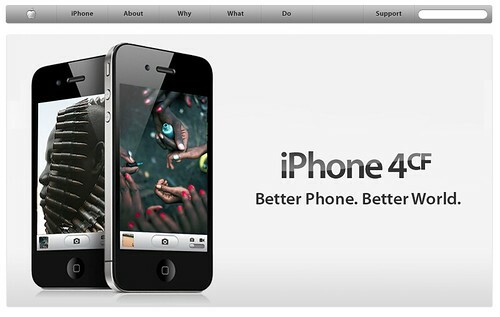 In what I have reason to believe is a new campaign from the Yes Men, a web site has launched announcing a free trade-in program for the iPhone 4cf, a new “conflict free iPhone.” See my previous blog post about some of the ethical issues of the iPhone manufacturing process. This new site is a brilliant example of cyberactivism following up on the spoofed New York Times print and web edition the Yes Men created in November 2008. And, it’s been timed to occur on the same day as an Apple event that was advertised as “. . . Just Another Day. 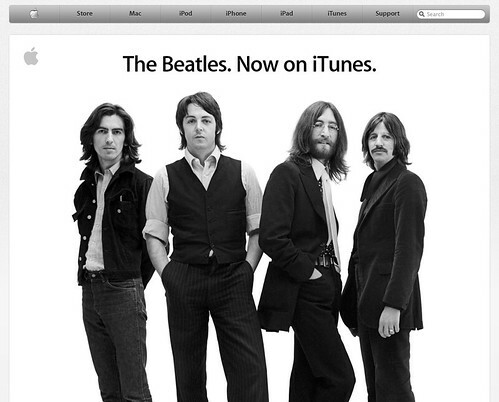 That You’ll Never Forget” which turned out to be an announcement earlier this afternoon that Apple is including the Beatles catalog in iTunes. On the same day John Lennon, the counter-culture musician who penned and sang “Give Peace A Chance” is plastered across the Apple homepage, this site launches asking consumers to engage with manufacturers, mining companies and lawmakers. Today, from your iPhone, you can consider the connections between genocide and mineral sourcing for technology production, and then go over to iTunes and purchase “Come Together” for $1.29 (Timothy Leary’s campaign anthem in his California Governor’s race challenging Ronald Reagan in 1969). The power of the Yes Men campaign comes from this mind-bending juxtaposition, and the way that experiencing these two announcements draws the user into consciousness about the modes of production without ever using the term or even mentioning capitalism. The Conflict Free iPhone site mimics Apple’s web presence precisely, the layout and style are indistinguishable from a site Apple might produce. 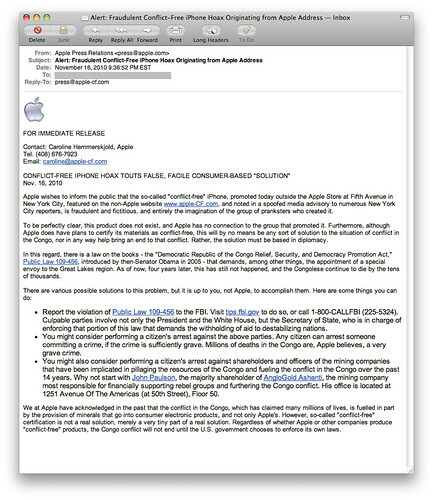 The text claims that the “new iPhoneCF guarantees to all its customers the same high quality phone as the original iPhone 4 with the added bonus of taking you one step closer to a world without conflict.” And further reports that Apple has decided to ensure the minerals used in the production of their devices are not sourced from mines in Africa “under the control of rebel groups further fueling a conflict that has has killed more than 5,000,000 civilians.” Apple’s CEO, Steve Jobs, has previously answered questions from consumers about the sourcing of minerals used to manufacture the iPhone, stating that “there is no way to be sure” about the source of minerals. The site can be seen at http://apple-cf.com and the following slide show contains screen shots of the pages, in case they’re taken down by the cease and desist that I imagine Apple’s lawyers are sending out right now. Under the “Do” page, the site offers 7 steps consumers can take: 1. hold the technology industry accountable by calling for a code of ethics in manufacturing; 2. engage in consumer education, ask questions; 3. take steps to enforce S. 2125: Democratic Republic of the Congo Relief, Security, and Democracy Promotion Act of 2006; 4. report violations of the law to the FBI; 5. perform citizen’s arrests of officials who are breaking the law; 6. perform citizen’s arrests of shareholders and officers of mining companies “implicated in pillaging the resources of the Congo and fueling the conflict in the Congo over the past 14 years”; and 7. support a class action lawsuit filed against a Canadian mining company. The site was brought to my attention by a “press release” from “Apple” revealing the site as a hoax. Another sharp example of the way the Yes Men frequently play both sides of the corporate vs. activist game, first acting as the corporation itself in making an announcement, posing as the company, and then posing again as the “real” company denying that the previous action was authentic.